Buy art and support WCA/NH here! 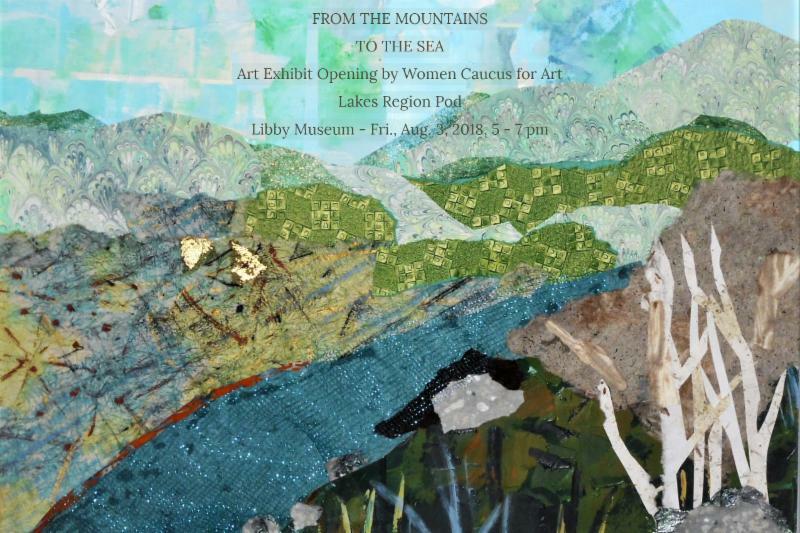 The Libby Museum in Wolfeboro will host an exhibit by members of the Women’s Caucus for Art, New Hampshire Chapter who live and work around the Lakes Region. Featuring the work of twelve women artists with a wide range of styles and media, the exhibit will open on August 3, 2018, with a reception that evening from 5:00 – 8:00 p.m. which is open to the public. The exhibit will remain on view through September to Labor Day. Founded in 1912 by Dr. Henry Forrest Libby, a collector and amateur naturalist, the Libby Museum of Natural History is owned and run by the town of Wolfeboro. 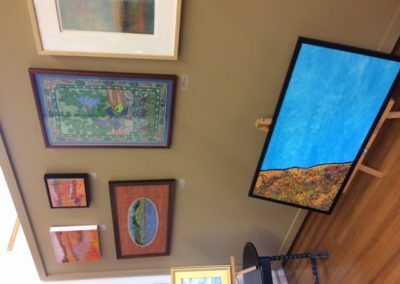 Open seasonally, it shows work by local artists as well as its unusual and eclectic collection of natural artifacts. It has a boat launch and can be visited by car or boat. Carole Groenke is the founding member of the Lakes Region WCA/NH group. She is a mixed media artist whose works often involves a social message. This winter she curated a show at NHTI in Concord called “Her Water Her Future,” which included both works of art and speakers on the issue. She lives in Gilford. 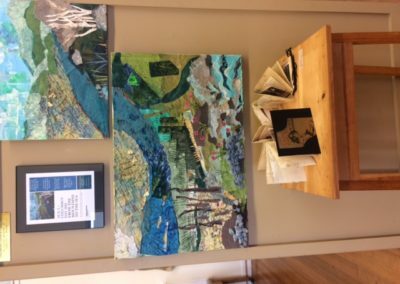 Anne McMillan, is the treasurer of WCA/NH, and is a mixed media and fiber artist using book arts, relief printmaking and surface design to convey a story. In April she exhibited in collaboration with Dayna Talbot in the installation piece “No Mistakes, No Failures” a grouping of 10 panels approximately 9” x 6’ in the Saori style of weaving incorporating strips of failed artwork donated by members of the WCA/NH at the 3S Artspace in Portsmouth, NH. Dayna Talbot‘s more recent work focuses on fiber, printmaking, and sculptural installations. She is particularly interested in methods used to overcome the struggle for balance in today’s world. 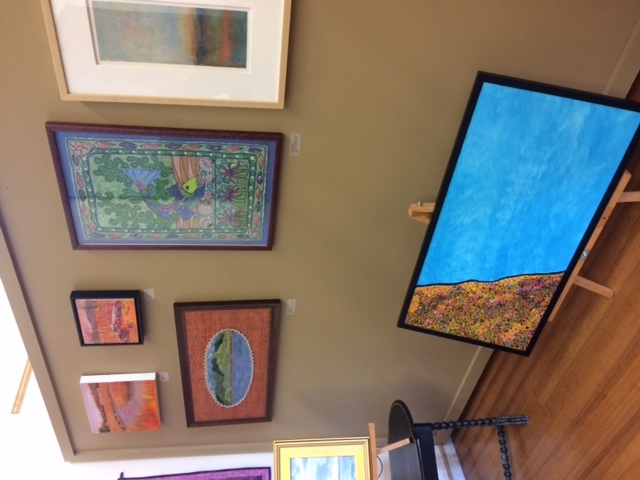 Recently, Dayna collaborated with 3S Artspace on an exhibition for Women’s Caucus for Art. Included in the exhibit were the 10 woven wall hangings she and Anne McMillan designed from discarded artwork from the members of WCANH. 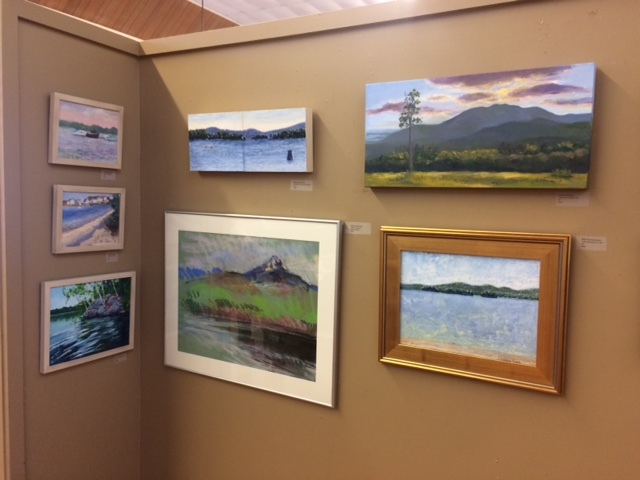 Stephanie Blackstock, a member of WCA/NH, is a painter/multimedia artist who lives in Ossipee. 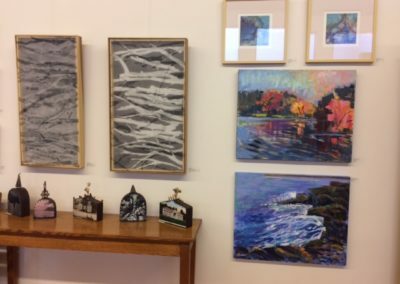 A graduate of Maine College of Art, she exhibited her work at the Libby Museum in 2014 and is the organizer of this group show. 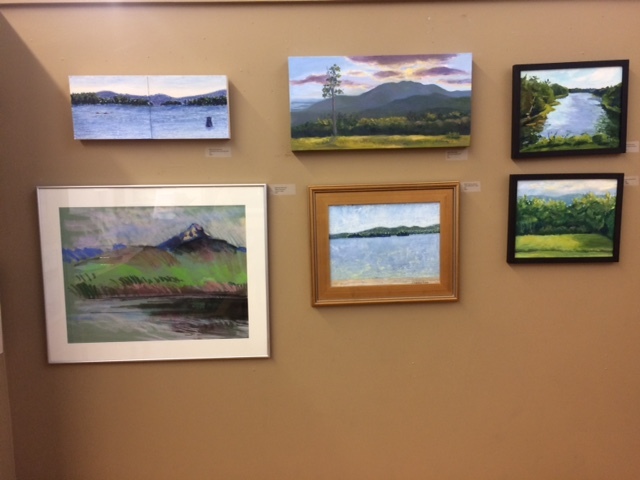 Her work has been seen a numerous venues around New Hampshire and New England. Lauren Hammond is an instructional support teacher and art teacher at Brewster Academy. Currently her focus is oil painting. She is an active member of the Governor Wentworth Arts Council and the Women’s Caucus on the Arts. 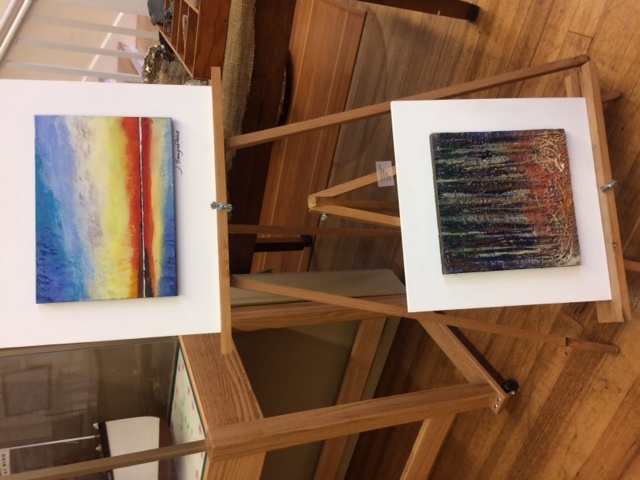 On August 11, Hammond will be offering a “pour painting” workshop at the Libby Museum (no artistic experience required). Call the Libby to register. 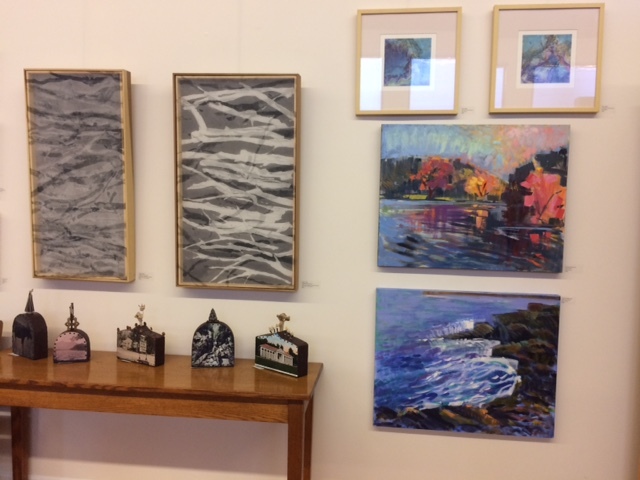 Kimberly J.B. Smith is a mixed media artist and sculptor as well as an art columnist for the Weirs Times. 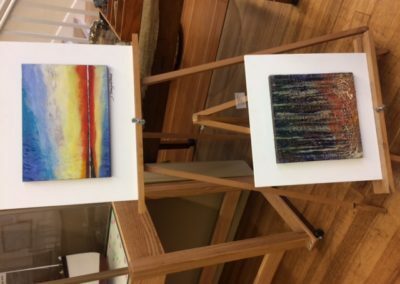 Smith exhibits with the WCA/NH, the New England Sculptor’s Association, and the Newburyport Art Association. 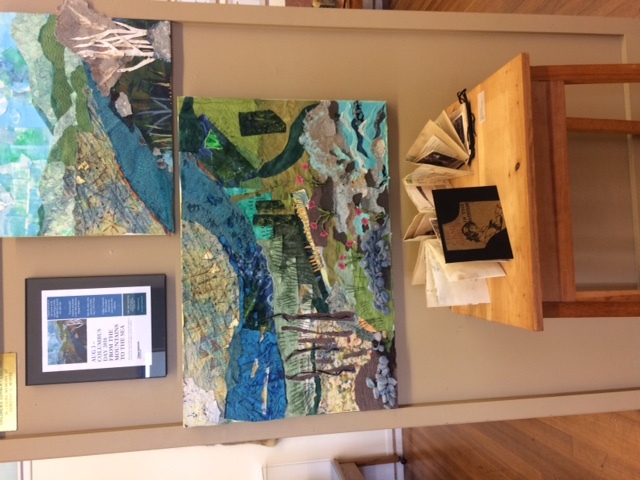 In addition to teaching art from Kindergarteners to adults, Smith offers workshops in mixed media and altered book art. 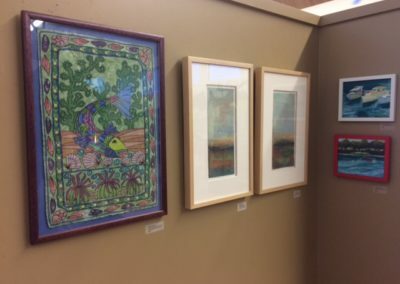 Kate Higley, the past president of WCA/NH, is a printmaker and painter who lived and worked in Wolfeboro for many years until moving to the Seacoast last summer. 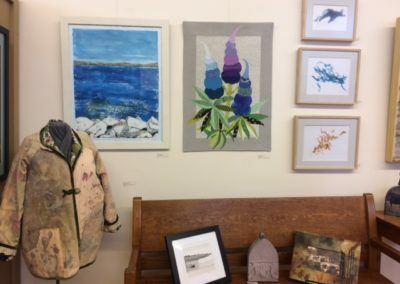 Her work was featured in ArtScope Magazine last winter during her solo show at Great Bay Community College in Portsmouth where she teaches printmaking. 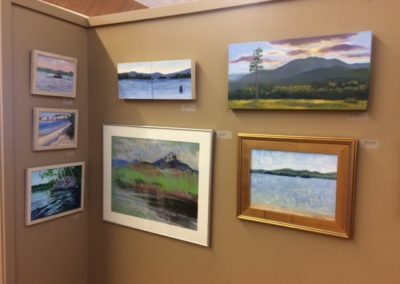 Betty Flournoy Brown‘s exhibited paintings have been in WCA/NH “Force of Nature”, Cambridge Art Association “Blue, More than a Color”, and The Museum of the White Mountain “Taking the Lead, Women and the White Mountains”catalogs. Last summer, she curated an exhibit, “Beyond the Visible” at the Wolfeboro Azure Gallery, that connected NH landscapes with environmental concerns. 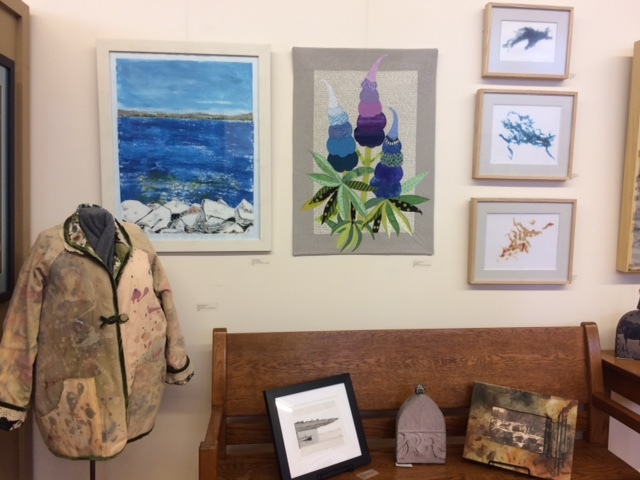 Robin Cornwell is a 35-year veteran art teacher and fabric artist. Her inspiration comes from the flowers and leaves she finds during her walks and in her numerous gardens. 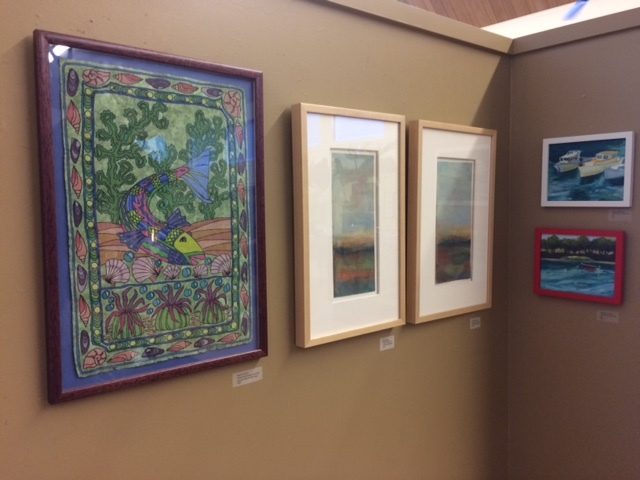 Her love of printmaking, pattern and color is evident in her art quilts. 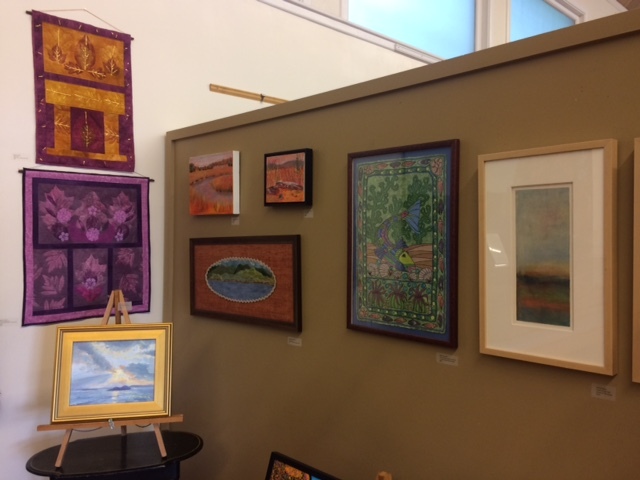 Robin’s work has shown in numerous galleries and quilt shows around New England. She teaches at Kingwood Regional Middle School and lives in Wolfeboro. Davida Cook is a printmaker and more recently an installation artist who created a large weaving for the 3S gallery in Portsmouth for the exhibit “ Glass Ceiling Unlimited View” of which she was co-chair. She has studied printmaking with Annette Mitchell at Plymouth State, and lives in Meredith. Her work has been shown in numerous exhibits around New England. Image: Collaborative collage by the exhibiting artists. WCA/NH is the New Hampshire chapter of the national Women's Caucus for Art, a networking organization for women in the arts. Our mission is to create community through art, education and social activism. WCA/NH membership includes several exhibition opportunities each year, bi-annual member meetings, ATC trading card exchanges and more.